Researchers at PsychTests.com advise managers to be wary of employees who express perfectionism as one of their strengths. With their excessively high expectations, perfectionists will often make themselves, and those they work with, miserable. There are certain traits that HR managers should consistently look for in a job candidate, like conscientiousness, accountability, and integrity, but researchers at PsychTests advise that perfectionism should not be one of them. Most HR managers will roll their eyes when a job candidate dutifully states that their biggest weakness is their tendency toward perfectionism, but what about those who declare it as their strength? Researchers at PsychTests who analyzed the responses of 264 extreme perfectionists and 142 non-perfectionists indicate that perfectionism is more likely to be a liability than an advantage. 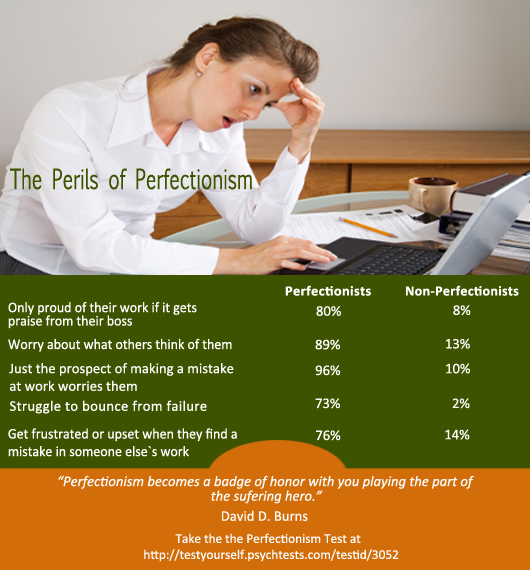 According to data they collected using their Perfectionism Test, 66% employees who are perfectionists are more likely to miss deadlines if they don’t think a project is good enough, and 31% have consulted a professional (therapist, doctor) to help them with a stress-related problem. In terms of job performance, 46% of perfectionists were rated as “Good,” 42% as “Satisfactory,” and 12% as “Poor,” compared to 58%, 42%, and 1% respectively for non-perfectionists. “The worst part is, perfectionists are not just hard on themselves – they are also likely to be hard on other people. This makes them a challenge to work with and a liability. They’ll struggle to get work done on time, will often require reassurance that they are performing up to par, they’ll have difficulty accepting criticism, and will often be unpleasant for others to work with because of their tendency to be pedantic. Managers will have their hands full with a perfectionist. It will be like handling a ticking time bomb: it won’t be long before their excessive meticulousness and perfectionism blows up in their face,” concludes Dr. Jerabek. Avoid “black and white” thinking. Don't approach a challenge or goal with an "all-or-nothing" attitude (e.g. saying something like "I have to get this promotion or else I'll never be satisfied with my job."). If you only see the outcome as a success or failure you're already sabotaging yourself. As long as you learn from your mistakes you automatically turn the outcome into a success. Set realistic goals. If it's your resolution to stop world hunger in five years after you’ve climbed Mount Everest, then you'll probably end up disappointed. These goals may sound noble, but the point is that if you set your sights too high, your fall will be harder. Set the bar high but within reach. Even if you don't accomplish everything you set out to do, the fact that you did your best is something to be proud of. Challenge your perfectionistic assumptions. Keep a journal of your thoughts, moods, and daily activities. Write down events that happen, how they make you feel about yourself and how you interpret the situation. Next, consider the situation from other perspectives and write these down too. How would someone else you know interpret the situation? Do a little introspection. In many cases, people who point out flaws in others do so to feel better about their own shortcomings. If you realize that you feel better about yourself when you rip into someone else for messing up, then the fault may lie in you. Try working on increasing your own self-esteem rather than bringing down someone else's. When it comes to job performance, perfectionism is more likely to be a liability than an asset.Perfectionists take accountability to the extreme; they have trouble letting go of the fear of other people’s opinion, of making mistakes, and of failure.